It is safe to take the next step. Too often fear gets in the way of you taking the next steps towards your greatness. Perhaps there’s something you know you need to do, yet don’t do it. Remind yourself that each next step (whether or great success, or a difficult “failure") is leading you to where you’re meant to be. Trust this is true, and as you do so, you’ll begin to see that it is absolutely safe to take the next step. It will only lead you (one way or the other) to being more of who you’re here to be. Life is a choice ... We just live alone, although sometimes it is dangerous choice .... There is a good recipe, just enjoy. Sometimes we also need luck too, right? Nice reflection. 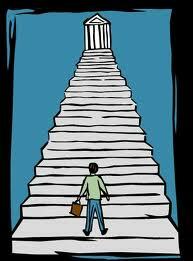 I think that the hardest but surest way to achieve something is taking that first step forward. Sometimes we understand what it takes, we learn which actions to take, prepare ourselves to take the leap but fall short of taking that one final step. Thanks for reminding me! I myself write on a daily basis on anything that has to do with self improvement and I enjoy it tremendously. Personal Development.